When I first started to cloth diaper I tried the frugal tip at Born to Love, washing them in the tub using old bath water, and it didn't work for me. 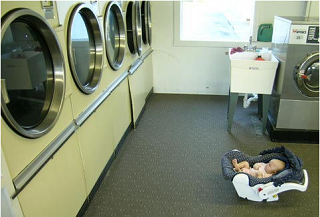 I have two children in cloth, my daughter is finally starting to potty train but still wears cloth half the time, and I have to use a laundromat for the washing and drying. Right now it costs me $2.00 to wash and $1.50 to dry (.25 = 8 minutes, and I usually dry for 48 minutes), and I wash two loads a week, so that's $7.00 per week. Using WalMart brand disposables would cost me $15 per week, so I'm still saving money. When my daughter potty trains I'll be even, but there are so many more benefits to using cloth over saving money: not putting chemicals on your baby, better for the landfills, no human waste in landfills leeching into the water supply, etc. Plus it's a heck of a lot cuter than using disposables. I don't dry my Bumkins diaperss or my covers. I use a wooden drying rack for these. You don't HAVE to use a dryer, it will just take longer for stuff to dry if you hang dry. If I am short on funds, I dry however long I can and then hang them up to finish drying. If I delay washing for a day or so, I use the huge washing machine for $3.00, which is cheaper than using two $2.00 machines, and I still dry for $1.50. So, using cloth with a commercial laundromat is not necessarily more expensive than using disposables. You can get some Chinese Prefolds, some Thirsties diaper covers, some hemp doublers, make your own fleece liners, make your own wipes, and come out ahead (like me!). Thanks to Melanie for this Frugal Baby Tip!